Last week, after the inaugural lunch of the "yet-to-be-named" dining club with friends Robert Wolf (author of Grand Tally), and artist Jeremy Marlow in a downtown Decorah, Iowa restaurant, I was about to get back in the pickup truck when my eye caught sight of a slush-sodden, folded piece of feint-ruled paper, lying in the gutter – it appeared to be a hand-written shopping list. I was intrigued. Memories were rekindled of the “trash book” I bought several years ago in England at a London Artist’s Book Fair. 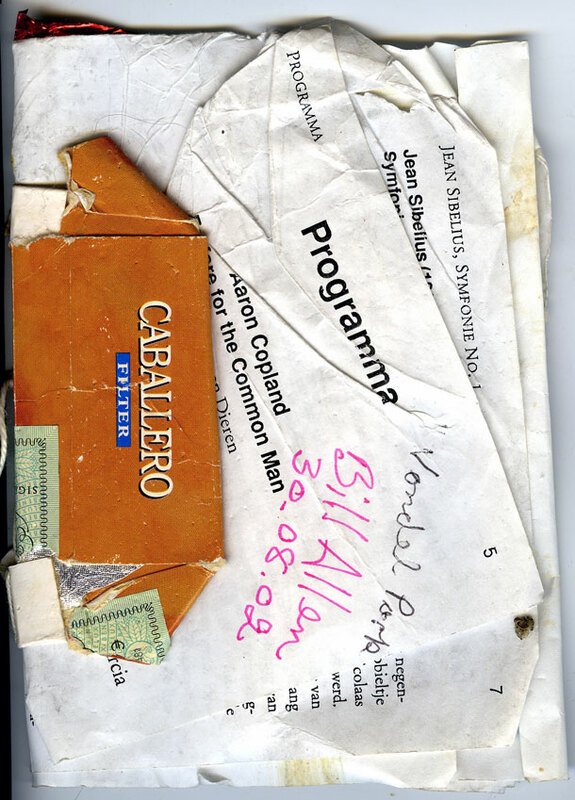 Would you believe I once paid £15 ($23) for this “bound” (single-section) book made by Bill Allen from garbage collected in Vondel Park, Amsterdam? Mind you, it’s signed and dated by the artist, and remains one of the most treasured items in my collection of books and prints. [I wonder if it has appreciated in value.] 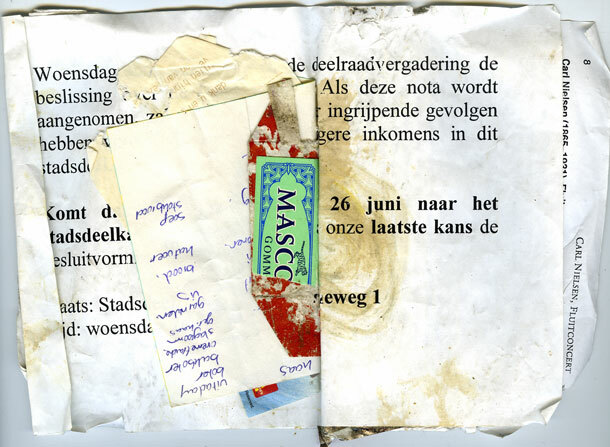 It comprises a cigarette packet, a tram ticket and a hand written note together with other intriguing weathered pieces of foot-trodden, rain-soaked ephemera. The “pages” have a distinct patina and it was remarkably different from the other books being offered at the book fair – perhaps one of the reasons why I bought it. People like to wear gloves when handling this book. Shortly after acquiring this book I was invited to participate in a panel discussion at Bob Fleck's Oak Knoll Book Fest in New Castle, Delaware. Ink on the Elbow had just been published, I was on a high, and decided to collect some trash for a book that would become the subject of my presentation. Old colonial New Castle is a pretty, tidy, town and trash is hard to find. However, I was lucky enough to find enough pieces that might make some form of a book. 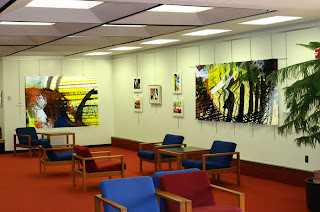 “Trash books” can comprise anything and are composed of many different layers of material and meaning. On this occasion I was particularly excited to have found a hand-written shopping list on pink, ruled paper. Here was poetry. I collected my ephemera in a nondescript brown paper bag. Found words, especially as hand-written notes, of which shopping lists are common, have always been of interest. There is a strange poetry in the lists of vegetables, groceries, toiletries and mundane, everyday items. Recently my growing interest in cooking has engendered a particular interest in recipes and their ingredients. 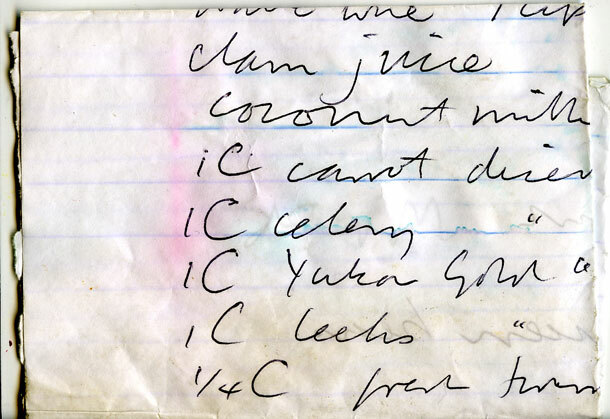 Picking up that slush-sodden piece of paper from the melting snow, and looking more closely, I deciphered the handwriting and read with palpable excitement, “lobster tails, white wine, little-neck clams, clam juice, coconut milk, star anise . . . carrots . . . celery . . . onions, Yukon Gold potatoes . . . leeks”, I thought, “Wow! 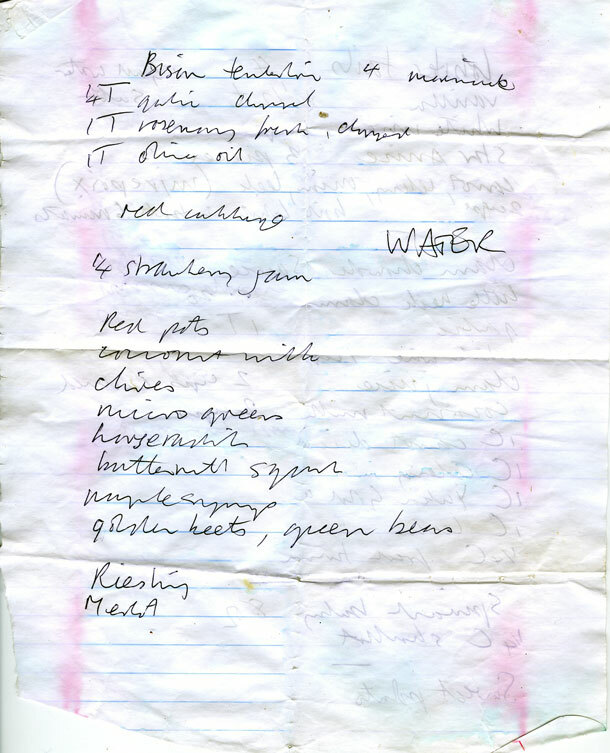 who in Decorah cooks like this?” Not only had I found an interesting list but also an unusual list of ingredients. I put the saturated trash between some dry papers and forgot about it. Yesterday, I remembered the intriguing piece of flotsam and jetsam, and found the now dry, folded page, stained pink and blue, in between some other ephemera. 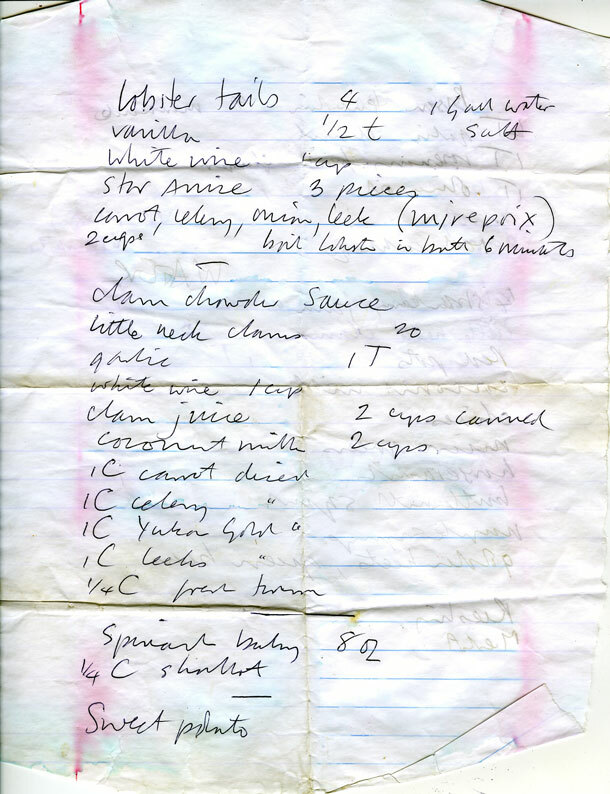 Opening it out, I grew increasingly excited – this was indeed a two-sided list of ingredients for a meal! Overleaf from the clam juice the first item was “bison tenderloin” – this was no ordinary meal. I set up the scanner . . . and then it dawned on me . . .
. . . this was my own shopping list for our dinner recreating President Obama’s inaugural lunch! Having published his first inaugural address in 2009 as My Fellow Citizens, I followed the 2013 inauguration with considerable interest thinking “sequel”. 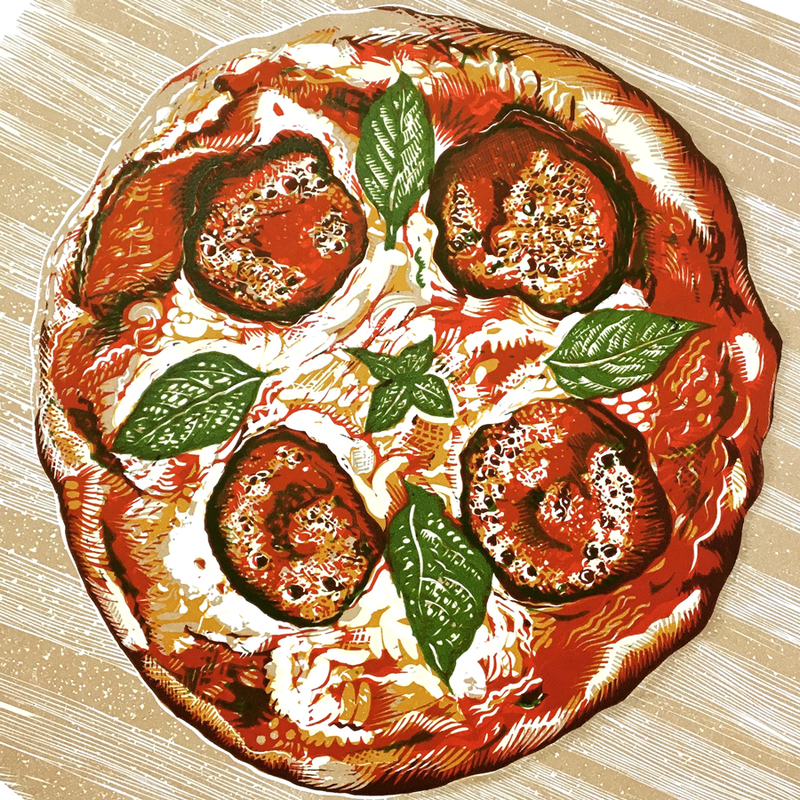 Perhaps the President's inaugural lunch recipe would make an interesting illustrated book . . . .
You can find the menu, recipes and photographs of the dishes together with lots of interesting commentary in Eddie Gehman Kohan’s post on the Obama Foodorama blog.